Network Firewalls provide a controlled single point of contact between your secure internal network and the untrusted network beyond to allow you to control against unauthorized incoming and outgoing traffic. Only allow authorized traffic into your organization based on predefined application and user-specific policies. Current network firewalls provide sophisticated tools for intrusion detection at a granular level, including full packet inspection on encrypted traffic, application-level inspection, and intelligence from outside the firewall to better protect your network. Palo Alto Networks' next-generation firewalls are natively integrated with their security platform and identifies all network traffic based on applications, users, content and devices, and lets you easily develop security rules for your business policies. Provides complete visibility of all network traffic based on applications, users, content and devices. Automated security reduces manual tasks and enhances your security posture. Cisco Firewalls - Cisco Firepower Next Generation Firewall (NGFW) combines proven network firewall with the industry’s most effective next-gen IPS and advanced malware protection. It is an an adaptive, threat-focused, next-generation firewall. Cisco NGFW allows you to discover threats and enforce security policies, detect, block and defend against attacks, and remediate breaches and prevent future attacks. The Cisco Meraki MX is next-generation firewall that is centrally managed over the web with cloud-based centralized management. Fortinet's Enterprise Firewall provides next-generation firewall, application control, intrusion prevention, web content filtering, Virtual Private Networking (VPN), spyware prevention and malware defense. It communicates with the Fortinet Security Fabric when it detects an event to enable an intelligent defense against emerging threats. It offers a consolidated architecture with a single network security operating system managed through a single pane of glass to maintain, configure and control security policies including logging and reporting. Juniper offers high performance security solutions for the data center; for private cloud, hybrid cloud or public cloud environments; and for policy-based awareness and control over applications, users, and content to stop advanced cyber-threats. Provides solutions to supports the changing needs of cloud-enabled enterprise networks. 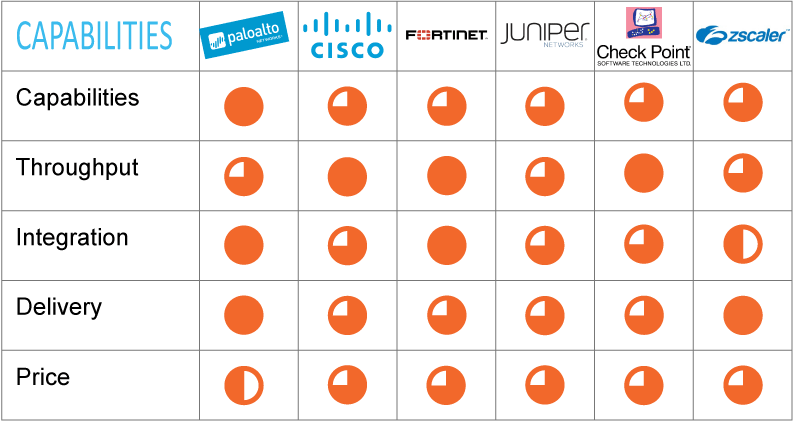 Juniper uses the AppSecure features to deliver application-aware security services. Check Point provides customers of all sizes with the latest data and network security protection in an integrated next generation firewall platform, reducing complexity and lowering the total cost of ownership. Check Point provides both Cloud and Data Center security for customers of all sizes. It can be delivered virtually or on specific appliances. Check Point products are available for public and private cloud on VMware, Amazon AWS, and Microsoft Azure. Zscaler firewall is an application and user aware firewall. It is cloud based and requires no additional hardware or software on premise. Zscaler also offers traditional firewall capabilities such as control over network ports and protocol. Zscaler applies security policies as it routes all traffic through its globally distributed security cloud and offers advanced threat protection for all users, regardless of location or connection.